Google chrome is a fast web browser as compared to other browsers. Google chrome has many new features that other browser do not have. Just like Window’s system task manager, it has own in-built Task Manger feature. You can view basic and detailed information about all processes along with associated memory usage. 2. Right click on empty space to the right of + button to open task manager. Alternatively, press Shift key + Esc Key to launch task manager. 3. It will show basic information of opened pages, features with corresponding memory, cpu and network details. To view finer details click Stats for nerds button. Task manager is a useful feature for keeping eye on processes causing drain on memory and other resources. 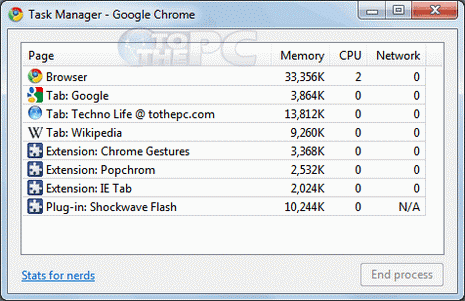 If your Google Chrome is running slow, better check usage details using this task manager feature.